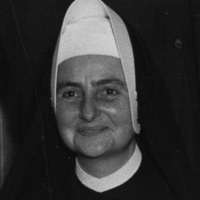 Listen as Jean Dolores Schmidt, BVM, faculty member, and administrator at Mundelein College, describes the organizing efforts students undertook in response to the Kent State massacre. 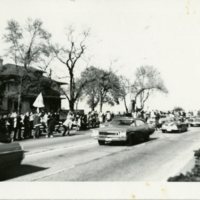 View of Sheridan Road from the west during the student strike, 1970. 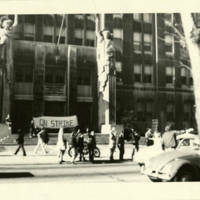 View of Mundelein College from the south during the student strike, 1970. 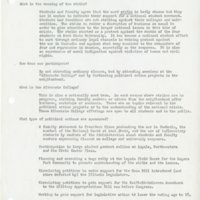 Note to those who might cross the picket line, May 6, 1970. 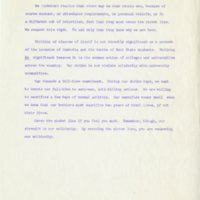 The note ends with a reminder: "By crossing the picket line, you are weakening our solidarity." Fact sheet on the Mundelein Student Strike. Click this image to explore both pages of the fact sheet. 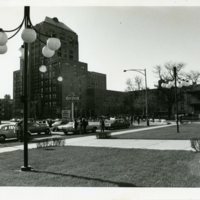 View of the Mundelein Skyscraper during the Student Strike, 1970. 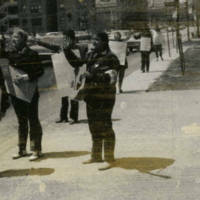 Students picketing during the strike, 1970. 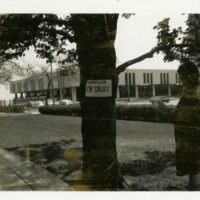 The sign on this tree reads: "Mundelein on Strike," May 7, 1970. May 4, 1970 marked a turning point in the youth revolution of the 1960s. After 67 rounds fired, 13 students injured, and 4 youth fatally shot by National Guardsmen during a fateful antiwar demonstration on the campus of Kent State University, Mundelein undergraduates, like their peers nationwide, reacted with fervor to the militaristic response to Vietnam protest. 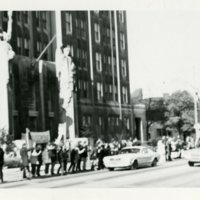 In return, these students only intensified their efforts, radically altering their very way of life by putting a stop to classes and a start to the “Student Strike,” a round-the-clock curbside picket along Sheridan Road.